Murderglitter, that was brilliant! So very Selkie. Selkie reads books, Selkie has a macabre sense of humor. Mandy doesn’t read books for fun, and finds Selkie’s humour odd- if not off-putting. Ergo; books give your u a macabre sense of humour….? Depends on the books. Amanda seems more of a light-hearted Romance/Adventure/girl power princess type. I’m sure she would enjoy the “Rejected Princesses” book. I suspect that Amanda might be less inclined to punk but definitely not goth. Selkie seems more mad science, adventure/macabre punk/goth type of reader. Heck yea! I like those too. She might also enjoy Holub’s Goddess books. When will Selkie learn the “Amanda Hug-and-Kiss” joke? It’s from an old Simpsons episode. A Man To Hug and Kiss. It’s one of Bart’s prank calls to Moe’s Tavern. Bart asks to speak to “Amanda Huggenkiss”, and Moe calls out to his patrons, “Amanda Huggenkiss? I need Amanda Huggenkiss.” Laughter follows, and they are laughing AT Moe, not with him. Transcript: The precise address, just in case you get lost around the island. Agent Brown is so dialed in, he even knows when to break the fourth wall and change scenes. What do you get in Todd’s will? I am loving the Selkie / Amanda dynamic at the moment, mainly because they seem to be behaving in the nicest way you might expect, given their personal and joint histories. There were times in the history of this comic that I was genuinely angry with both of them, and I had to step back and remind myself that I can’t judge either of them through the eyes of a reasonably well-adjusted adult. It’s one of the reasons I love this comic: Dave never forgets that his characters are of many ages and many backgrounds. I was harshly bullied at school from when I was eleven until when I was fourteen, and I had no idea how to deal with it. I used to cry on my way home, then cry again in my room. I always hid it from my parents. I suppose I initially disliked Amanda so much because she reminds me of my childhood bullies. I suppose the reason I also react so negatively to Selkie (when she is mean to Amanda) is because she reminds me of the times I lashed out at people that were even worse off than me. I never directly picked on them, but I wish I’d had the courage to stand up for them at the time. It’ll be kinda funny if we see him and he’s the sweetest person on earth. Why does Amanda know sarnothi if she was enemies with selkie? Amanda doesn’t know the language. She’s reading K’Limdai phonetically. She doesn’t, she’s saying what K’Limdai sounds like to English ears. 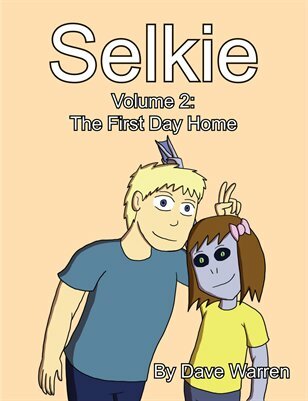 In regards to the comic I still don’t get how the orphanage got “Selkie” from Nei li” either. Mikael, its not really your fault, English is a HORRIBLE language for pronunciation based on spelling. I routinely apologize to my Japanese students for it. Every single one of those is pronounced differently from the others. Its a freaking mess. Give me Japanese or Spanish or any of those other languages with their regular vowels and consonants any day. The one upside of English is that native speakers learn so many different mouth sounds, its easier for us to pick up other languages which tend to have fewer, than vice versa. The L/R difference is particularly tough for many Asian language speakers. TH can be another tricky one.